?I was hit by a driver cited for a DUI. What happens now? ?What is my car accident case worth? ?How long do I have to file a claim after a car accident in Georgia? In most cases, people who experience a concussion after a car accident will fully recover within three to four weeks. However, about 10% will develop what’s known as post-concussion syndrome and will be entitled to additional compensation in their personal injury claim. People with post-concussion syndrome experience symptoms that are similar to those they would have immediately following a concussion. The difference is that their symptoms may continue for months or even years after the concussion has passed. Women and older adults are more likely to experience post-concussion syndrome, although experts are not sure why the condition is more common in these particular demographic groups. Children are less likely than adults to develop post-concussion syndrome. Since they are still growing, their brains have the plasticity necessary to more easily overcome the trauma. Having had one or more past concussions will not increase your risk of developing post-concussion syndrome. However, multiple concussions can result in chronic traumatic encephalopathy (CTE). This condition causes dementia-like symptoms, and is often found in professional boxers, football players, wrestlers, and other athletes susceptible to repeated head trauma. Post-concussion syndrome can be difficult to diagnose because the symptoms overlap with many other conditions. 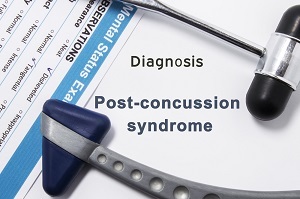 There is no single medical test a doctor can order that will prove you have post-concussion syndrome. It’s likely that your doctor will first order a brain scan to check for other medical problems that could be causing your symptoms. Either a computerized tomography (CT) scan or magnetic resonance imaging (MRI) can be used to identify brain abnormalities. 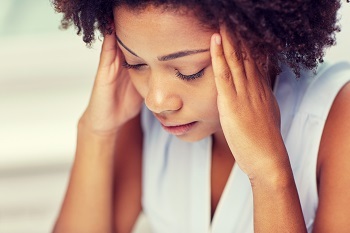 An ear, nose, and throat specialist (ENT) may rule out other causes if one of your primary symptoms is dizziness. You may also be referred to a psychologist or psychiatrist if your symptoms include anxiety, depression, or other mood changes. A concussion is treated with mental and physical rest to give the brain time to heal, but post-concussion syndrome has no specific course of treatment. Instead, doctors will make recommendations based on the patient’s symptoms. Amitriptyline, Topiramate, or Gabapentin may be prescribed for headaches if you aren’t getting relief from over-the-counter pain medications. Cognitive deficits can be treated with focused rehabilitation and training in using calendars, scheduling tools, or other memory aids. Psychotherapy or medication can be used to address anxiety and depression. Post-concussion syndrome can’t be cured, but symptoms can be managed and will often decrease in severity as time passes. Any physical injury from a car accident caused by another driver’s negligence is eligible for compensation as part of a personal injury claim. Unfortunately, cases involving post-concussion syndrome can be challenging because of the difficulty in obtaining a diagnosis and establishing a clear link between symptoms and the accident itself. Medical records, including the result of any diagnostic tests ruling out other possibilities for the cause of your symptoms. Testimony from your doctor stating that he believes your condition qualifies as post-concussion syndrome. A journal detailing your symptoms. Testimony from your employer or other people who’ve noticed your changes in behavior, memory problems, or difficulty concentrating. Because of the challenges involved in proving a diagnosis of post-concussion syndrome, it’s recommended that you seek the assistance of experienced car accident attorneys. Your attorney can help you gather the necessary documentation of your condition, arrange for any supporting expert testimony, and negotiate a higher settlement with the other driver’s insurance company. Rechtman & Spevak is dedicated to helping Georgia residents with post-concussion syndrome from car accidents receive prompt and fair personal injury settlements. Call 404-355-2688 or complete our online contact form to learn more. How Long Do I Have to File a Claim After a Car Accident in Georgia? Should I Talk to an Insurance Adjuster After a Car Accident?